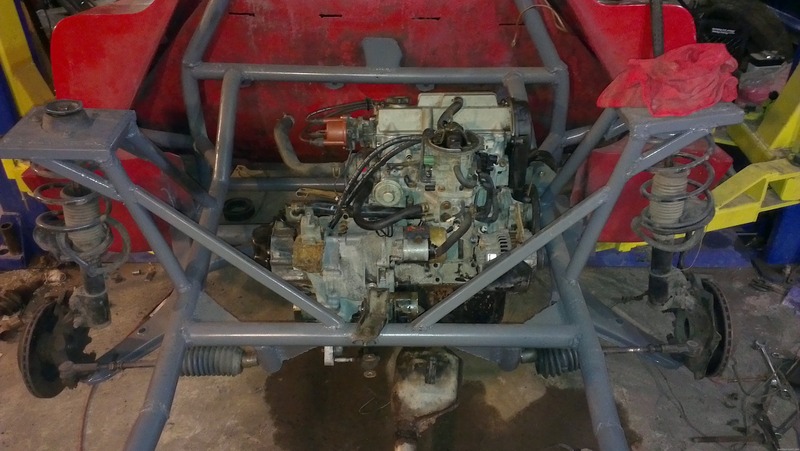 Engine installed and front suspension mostly installed. I went over the frame to make sure everything looked ok and so far it looks like everything is all good on it. So I started assembling some of the parts laying around the garage to try and free up some space. 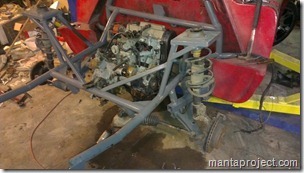 The engine and suspension parts are taking up the most garage space so that is the part I am working on first. The engine was pretty easy to put in. There is nothing else in the way so it was just a matter of putting it under the car and lowering the car into position. I still need to get some good bolts to bolt it all together but there are enough in it right how to hold it in place. After that I started putting all the parts together for the front end. The wheel bearings are bad but I don’t have new ones so They will do to hold the wheels in place. I put the springs and shocks in place and tightened up the ball joints. I will have to replace the wheel bearings and put a new set of non stuck calipers on it but I put them in place for now to get them out of the way. The suspension looks much nicer with the stock Mustang II parts gone. Hopefully the new parts are just as strong as the old. I still need to work on the steering and will have to fabricate something to make it work. The rest of the car is just bolting on parts now. I will start from the bottom getting the suspension done first then work my up. So probably the next thing to work on is the rear suspension. 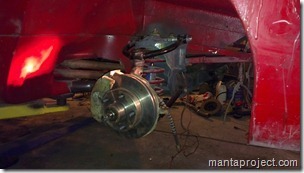 Then the car can finally roll around on the finished suspension. A big job, but a good way to make use of those little-engines-that-could. I put an ’88 turbo into a ’92 Metro convertible which I have a lot of fun with. Took me a while to fit the ’88 wiring into the ’92 car, though. I’m just dim, I suppose. The ’88 turbo has the nice “hemi” head as compared to the later GM economy inline valves. I assume you had to make up engine mounts and front suspension attachment points. Your pics answer my question, of course. I am curious, though, how you centred the once-steerable rear wheels. I can’t quite see how the steering rod arms are attached. 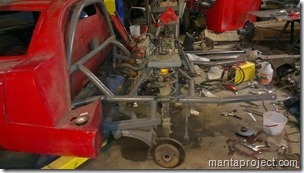 I attached the inner tie rods solidly to the frame. I mounted the inner tie rods in the same position they would be in the stock metro setup if the wheels were pointing forward, this keeps the rear from getting any bump steer problems and should keep it riding straight over bumps and around corners. 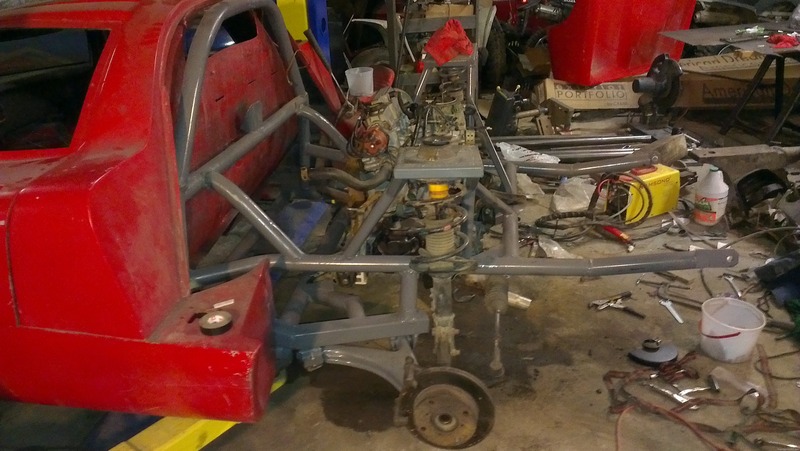 I will be redoing the mounting points when I get back to working on the car, hopefully soon I will have time to do more on it. 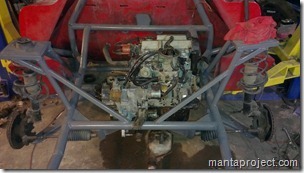 Rick Thompson on Engine installed and front suspension mostly installed. 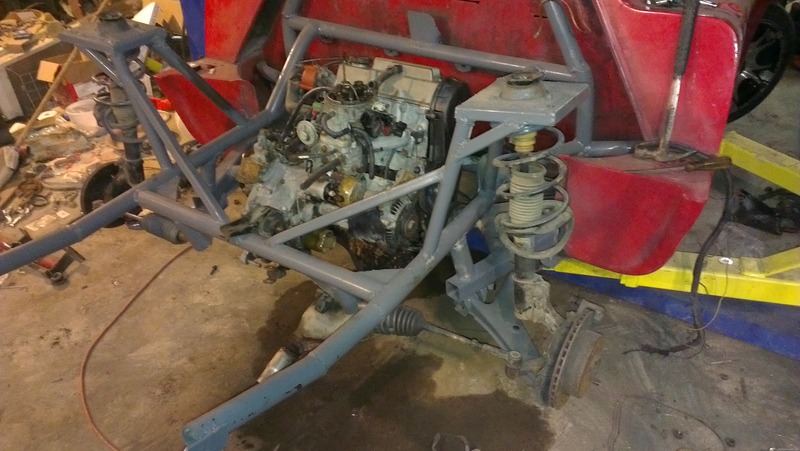 John on Engine installed and front suspension mostly installed. alain beaucage on Pics from the town of Man car show. Rick's Manta Montage © 2019. All Rights Reserved.